Optogait is a state of the art system of analysis that brings a proven philosophy of assessment to injury prevention and rehabilitation. 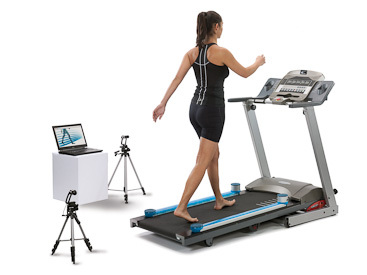 Classically, contact gait analysis has been precise, informative, and costly. This last attribute has limited its use to large biomechanical institutes. To control costs, simple contact pads have been employed. Contact pads, however, cannot assess dynamic motion. Optogait’s innovative design affords doctors, therapists, and researchers the ability to become their own high-tech laboratories; contact analysis is now affordable and portable. Systems range from one to 100 meters. When paired with a standard treadmill, all aspects of the gait cycle can be studied. Parameters (e.g., contact time, flight time, and pre-swing) can be measured to .001 of a second. Left and right differentials are recorded. Precise, objective data is correlated to determine extent of injury and effectiveness of treatment. All data is displayed in real time thru the software platform (affording instant decisions on treatment protocols) and paired with both lateral and sagittal video analysis. Data is stored over time, affording the clinician the ability to determine effectiveness of treatment. Injury prevention is enhanced via objective data, showing increased asymmetrical tendencies before pain sets in. 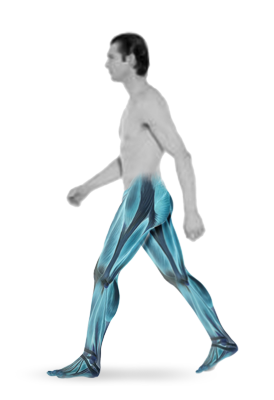 Chronic injuries are addressed via gait-empowered differentials, identifying the root cause of malingering problems. All aspects of dynamic motion are recorded to ensure your patient is functioning at his/her highest level. One meter system on treadmill: Have the patient walk at a slow speed. 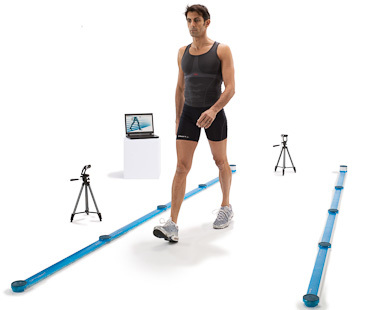 Observe the parameters of the gait cycle in real time. Make left and right comparisons of contact time, flight time, swing, etc. As you increase your patient’s speed, note if asymmetries are improving or worsening. When maximum efficiency is realized, record asymmetries and the treadmill’s speed. This efficient ‘rhythm of gait’ is a good starting point for clinical intervention. Footwear, orthotics, conditioning exercises, etc. may be employed to enhance patient symmetry. Pending the patient’s needs, gait protocols can be performed at any speed. A basic step test can be evaluated for biomechanical efficiency. Contact and flight time of each leg is evaluated for symmetry. Standard squat jump can be evaluated for maximum power. Pelvic angle can be noted instantly. Conditioning protocols can be based off this angle. One-legged jumps, in any direction, are employed to compare left and right power. Knowing the patient’s overall power is only one aspect; symmetry is key to all rehabilitative programs. Agility, left and right, is studied via simple ski tests. Left and right contact and flight times are easily compared. Effective treatment ensures there is no favored side. Larger installations of five meter or plus allow the patient to walk or run through the machine on nearly any surface. Again, all parameters of gait are easily measured. Differentials, left and right, are noted. Speed and acceleration of each leg can be measured. Every motion in all directions can be analyzed for symmetry. The length of the system is flexible. The width of the system can be a maximum of six yards. This affords the clinician the ability to lay out various ‘obstacle courses’ to analyze their patient’s gait. Surface EMG testing is made simple. There is no need for contact pads under the patient’s feet to correlate data. 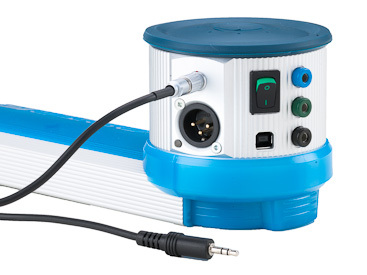 By interfacing with Optogait, all data is easily recorded and evaluated. The above tests are just a few of the many protocols that can be performed to analyze patients. Sub-clinical injuries can no longer hide; precise, effective treatment is ensured.